Palestinian amora of the fourth century; contemporary of Mani. 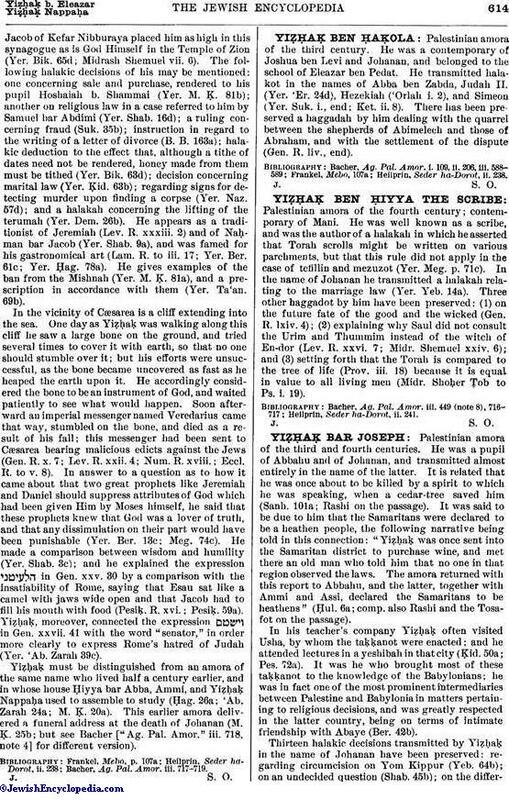 He was well known as a scribe, and was the author of a halakah in which he asserted that Torah scrolls might be written on various parchments, but that this rule did not apply in the case of tefillin and mezuzot (Yer. Meg. p. 71c). In the name of Johanan he transmitted a halakah relating to the marriage law (Yer. Yeb. 14a). Three other haggadot by him have been preserved: (1) on the future fate of the good and the wicked (Gen. R. lxiv. 4); (2) explaining why Saul did not consult the Urim and Thummim instead of the witch of En-dor (Lev. R. xxvi. 7; Midr. Shemuel xxiv. 6); and (3) setting forth that the Torah is compared to the tree of life (Prov. iii. 18) because it is equal in value to all living men (Midr. Shoḥer Ṭob to Ps. i. 19). Heilprin, Seder ha-Dorot, ii. 241.